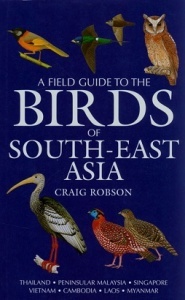 This fully updated edition of the award-winning A Field Guide to the Birds of South-East Asia includes more than 20 new species for the region which are recent discoveries, taxonomic ‘splits’ or have been recorded there for the first time. There are many new artworks and this edition has 16 more colour plates than the original, meaning fewer species per plate and therefore larger images of each species. The text has also been meticulously updated to take in the latest information on each species. The vast diversity of South-East Asian birdlife attracts increasing numbers of birdwatchers each year. This comprehensive field guide to the region covers all of the 1,327 species recorded in unprecedented detail. It forms a complete field and reference guide to the birds of Thailand, Peninsular Malaysia, Singapore, Myanmar (Burma), Laos, Vietnam and Cambodia and also covers a wide range of species found in the Indian subcontinent, China, Taiwan, Sumatra, Java, Bali, Borneo and the Phillippines. This unique and indispensable guide covers in detail the identification, voice, breeding, status, habitat and distribution of all the species and distinctive subspecies of the region. Hardback - 544 pages, 120 full colour artwork plates.